My favorite author is Issac Asimov. I love his character R. Daneel Olivaw as in the Robot and Foundation series: The Caves of Steel, The Naked Sun, Robots and Empire, Prelude to Foundation, Foundation and Earth. 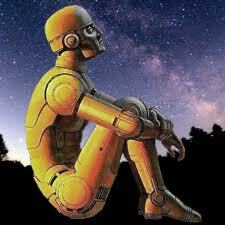 Is seems to me that Asimov created a new world, lived in it and shared his experiences with us. I am a relatively new author of sci-fi but I can identify with, what I believe, Asimov did to write his books. Which is live in the world of your writing and see what transpires. Don’t know if you ever noticed the talented kids in your middle school class who were drawing all kinds of great sketches while the teacher’s monotonous voice droned on and on. Though you may have when the teacher ripped up their art and embarrassed them in public. These are the people who create great stories and art. Orson Scott Card, created some of his best fiction by doodling and creating a symbolic world, that just had to be lived in. Then he found characters that knew how to live there. Whether he was one of them I am not sure, but he surely reported back to us on their lives. Like the doodlers, I have frequently lived in another world and for me it often happens at 2:00 a.m. When I awake, I get a great idea and write it down for the time the sun comes up. The funny thing, for me, is I find my books write themselves in this way. Once I draw the landscape, as Orson Scott Card did, but in my mind alone, inhabitants, who I now know well, come and live in it. They act on their strengths and weakness to live their soon to be revealed lives. As odd as this may sound, I can then read my story when it is finished and it is almost as if I had never written it. I end up being a big fan of my stories. What I am waiting for is to like mine better than Asimov’s.